Property 4: Cozy Cottage in Historic Silver Plume, Ski Pass Included For Entire Stay! Alma 'Cloud 9 Cabin' w/ Fireplace & Wooded Views! Property 6: Alma 'Cloud 9 Cabin' w/ Fireplace & Wooded Views! Property 7: Lovely log cabin with private hot tub & deck - dogs, hikers & skiers welcome! Property 8: Rose Haven Cottage is a small comfortable home. In the Heart of Montrose. Charming log cabin in the mountains. Property 10: Charming log cabin in the mountains. Property 11: Cozy Mountain Cabin! Property 14: Pet Friendly Cottage located between Old Colorado City and Downtown! Property 16: Perfect for the outdoor enthusiast & pet-friendly - the Little Hacienda in Silt! Con Alma, new home with Mountain Views ,minutes from skiing at Breckenridge. Property 17: Con Alma, new home with Mountain Views ,minutes from skiing at Breckenridge. Unique Bungalow furnished with antiques and collectibles. Very spacious. Property 19: Unique Bungalow furnished with antiques and collectibles. Very spacious. Property 22: Cozy Mountain Getaway! Quiet Retreat with private courtyard In Grand Lake Village! Property 23: Quiet Retreat with private courtyard In Grand Lake Village! Great views from the Jacuzzi!! Property 26: Great views from the Jacuzzi!! 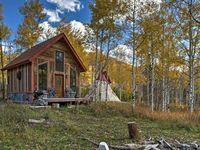 Property 29: A-Frame Cabin w/Mtn Views - 4 Mi to Cripple Creek! Peacefully! Away from City Close to Nature’s ! Property 31: Peacefully! Away from City Close to Nature’s ! Secluded Mtn cabin on 35 acres, Pikes Peak View! Hot Tub & Close to Attractions! Property 36: Secluded Mtn cabin on 35 acres, Pikes Peak View! Hot Tub & Close to Attractions! Enjoyable Mountain Cabin With All The Amenities! Property 43: Enjoyable Mountain Cabin With All The Amenities! Property 44: Marble Cabin w/Large Teepee, Fire Pits & Mtn View! 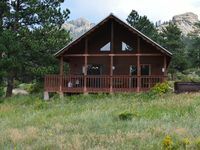 Property 48: Cozy Cabin In The Aspens Family Friendly And Close To All Outdoor Activities! Property 50: Book your mountain paradise vacation soon! If you're looking for a place to truly get away, this would be it! Cute little cabin located in a tiny town. No cell service or wifi so it truly takes you off the grid (which is somewhat concerning if an emergency arises). We had two adults and two bigs dogs. Honestly couldn't imagine having more than that in that amount space. Nothing super fancy about the place. Just a simple and cozy place to chill which is all we needed and wanted. Looks like newer appliances and some updates which was nice. No gas or food for about 45 minutes so stock up before you arrive. Lots of new builds nearby so it's not going to rural for long. Overall a really cool experience with a Teepee!! Beautiful views and good location. Loved the wildlife. Perfect for the six of us.